“Rawlings” manufactured ONL Feeney game-used baseball. Written on the ball in blue marker is the date “7-14-84” along with “2ND Shutout - Dodgers vs. Cubs 8-0 - 9K’s - 2 Hits - 1 Walk”. The ball shows excellent signs of game-use. “Rawlings” manufactured ONL Feeney game-used baseball. 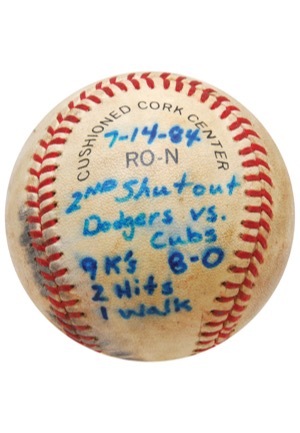 Written on the ball in blue marker is the incorrect date of “July 18, 1984” (game played on the 19th) along with “3RD Shutout - Dodgers 10 - Cards 0 - 9K’s - 2 Hits - 1st Big League RBI”. The ball shows signs of game-use. 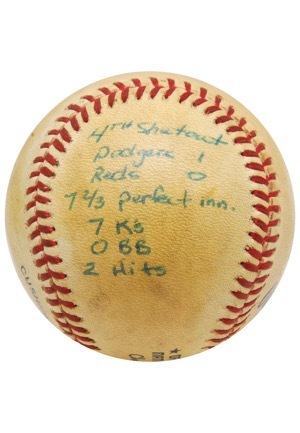 “Rawlings” manufactured ONL Feeney game-used baseball from 7/29/1984. 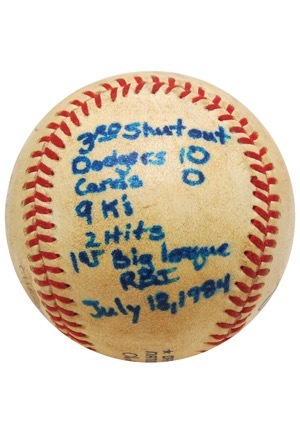 Written on the ball in blue ink is “4TH Shutout - Dodgers 1 - Reds 0 - 7? perfect inn. - 7 K’s - 0 BB - 2 Hits”. The ball shows signs of game-use. “Rawlings” manufactured ONL Feeney game-used baseball from 4/21/1985. 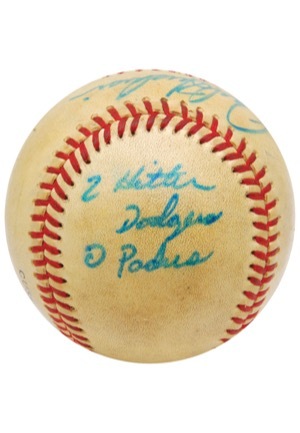 Written on the ball in blue marker is “2 Hitter - Dodger - 0 Padres”. 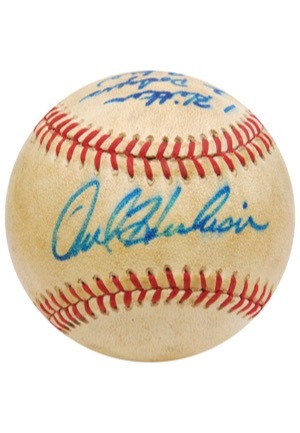 Orel Hershiser has signed the sweet spot in the same blue marker, in our opinion the signature rates a near perfect 10. The ball shows signs of game-use. “Rawlings” manufactured ONL Feeney game-used baseball from 4/26/1985. 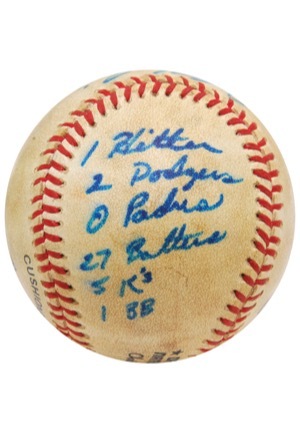 Written on the ball in blue marker is “1 Hitter - 2 Dodgers - 0 Padres - 27 Batters - 5 K’s - 1 BB”. 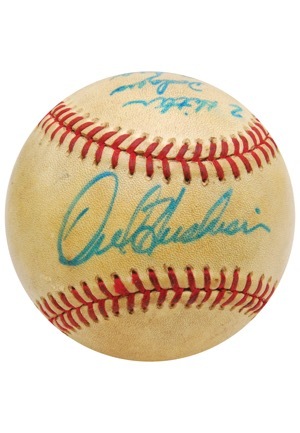 Orel Hershiser has signed the sweet spot in the same blue marker, in our opinion the signature rates a 7. The ball shows signs of game-use. “Rawlings” manufactured ONL Feeney game-used baseball from 7/23/1985. 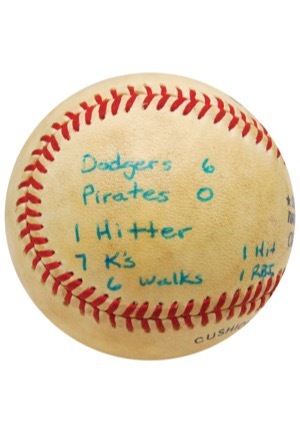 Written on the ball in blue ink is “Dodgers 6 - Pirates 0 - 1 Hitter - 7 K’s -6 Walks - 1 Hit - 1 RBI”. The ball shows signs of game-use. “Rawlings” manufactured ONL Feeney game-used baseball. Written on the ball in blue marker is the date “Sept. 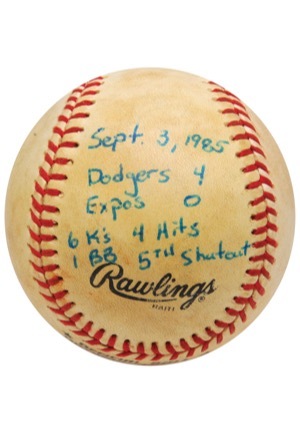 3, 1985” along with “Dodgers 4 - Expos 0 - 6 K’s - 1 BB - 4 Hits - 5TH Shutout”. The ball shows signs of game-use. Accompanied by a LOA from JSA for the signatures and an additional LOA from Orel Hershiser. Auction closed on Thursday, December 10, 2015.